I’ve been getting a little bored with my chocolate chip cookie recipe. I’ve had the same one now for over 16 years. Whenever I have had to take dessert anywhere, it has been my trusty go-to cookie recipe. On many occasions, it has been requested by friends and family. 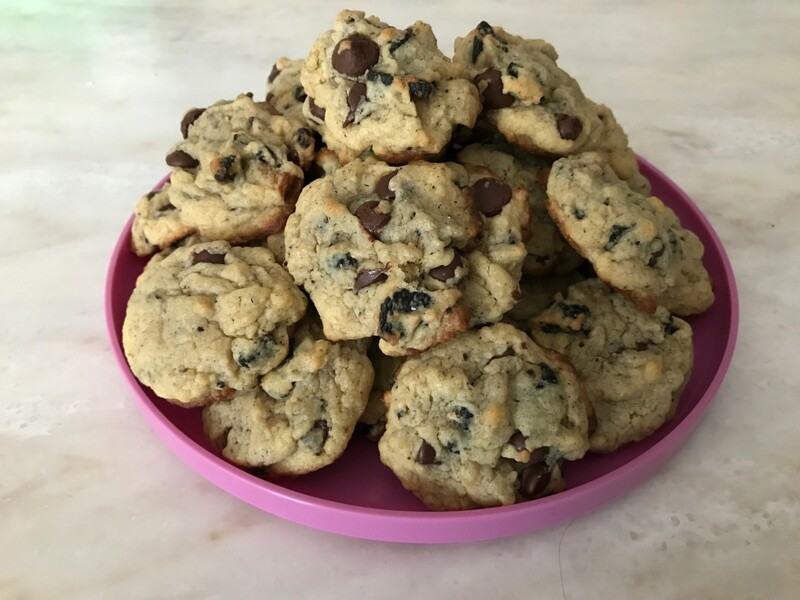 Hubby loves them so much, he often asks if we have any chocolate chips in the house. Immediately I know that chocolate chip cookies are what he is after. If we actually have the chips, cookies get made that very night. After all, he asks for so little that I can’t say no when he does want something freshly baked. Just recently, he asked for cookies again. Wanting to try a little something new, I asked if he would be opposed to a different variation of his favorite cookie. I got the green light, and Oreo Cream Cheese Cookies were born. 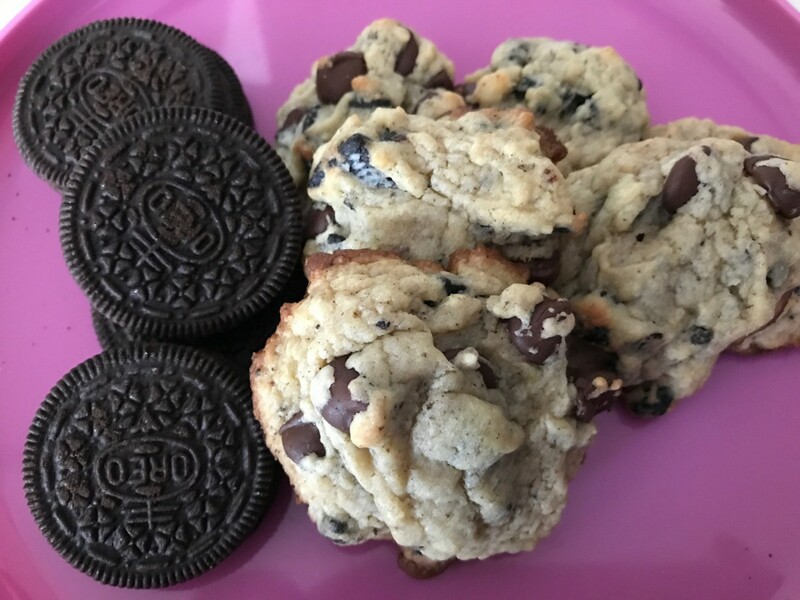 Oreo Cream Cheese Cookies are soft, chewy, creamy, and everything else a cookie should be. We enjoy ours just a touch on the doughy side, so we take them out of the oven after 8 minutes and they are perfect. Warm out of the oven, you can really taste the cream cheese. Add a glass of milk, and what more do you need? Umm…nothing! While I highly recommend a stand mixer due to the dough getting rather thick, it is not necessary. All you need is a little muscle and patients to work through the dough with a large spoon. I personally have a Kitchenaid mixer and swear by it. Seriously, this thing is the best invention since the oven! There are other less expensive mixers out there, however, I have not used one and cannot speak of their quality. I’m sure that they work just fine, though. While oven is preheating, place Crisco, sugar, and brown sugar in the bowl of stand mixer. On medium speed, mix with wire whip attachment until well combined. Add cream cheese and pudding mix of choice and mix in on medium speed until well incorporated. There should not be any large pieces of cream cheese. Add flour 1/2 cup at a time, mixing well after each addition. The dough should be soft and slightly tacky. Crush Oreos with fingers and add to bowl. Add chocolate chips. Mix in until cookie pieces and chips can be seen throughout the dough. Place spoonfuls of dough on a cookie sheet lined with parchment paper. On a standard sized cookie sheet, you will be able to fit 12 cookies. Do not press down on the dough mounds. Bake for 8-10 minutes, depending on oven. We found 8 minutes was perfect in our oven. *You can also mix ingredients completely by hand if you do not have a stand mixer. *The cooling racks recommended are so nice! They are stackable, so your kitchen counters are not overtaken by cookies spread out everywhere. I use mine every time I make cookies. Next postBullying in Schools: When Will Enough Be Enough? OMG! These look amazing! Will need to try the recipe when I have guests this weekend. Ooh what a lovely idea this is. The cookies look so delicious indeed. I love how easy they seem to make too. They are very easy to make! I am all about easy recipes! (haha). Thanks for visiting! Oreos are perfct. Everything you do with oreo is perfect unless stated otherwise! Nice recipe dear! Thank you, and I agree…you simply cannot go wrong with baking anything Oreo related! Thanks for reading! Oreos and cream cheese are a match made in heaven. Never tried to make them in cookie form, but we have a great cupcake recipe. Yum! An Oreo cupcake recipe sounds fantastic! Oreo’s and cream cheese are like they were made for each other, huh? Thanks for stopping by! Oreo Truffles are amazing! I haven’t made them in some time, but I do remember them being a hit at a work party. Thanks for visiting! It’s like oreos, cheesecake, and a chocolate chip cookie all in one and it sounds delicious! Cookie mash-ups are always a win! Thanks for reading! One can never go wrong with Oreos! They are so good in so many ways! Thanks to stopping by! I’m sorry to hear you’ve been having some bad reactions to something. Hopefully, you get it figured out soon! Although it is good that Oreos don’t affect you! If you do make these, be sure to let me know how you like them! Thanks for reading! They look extremely delicious. I must try to bake them. They are just wow. Thank you! If you try them, be sure to stop back and let me know what you thought. I appreciate you reading! OOH. These look good. I bake quite a bit and this recipe reminds me that I’m well past due for baking cookies with Oreos in them already. It’s been on my mind for years, spurred into memory every once and again by a recipe as delicious looking as this one. That’s it – this week I’m going to the store for some Oreos and getting to work! Oreos are so versatile in baking, aren’t they? Plus, a few usually get eaten on their own! Thanks for stopping by! Thank you! They are so easy to make, too. And the stand mixer is great, isn’t it?!? I don’t know how I ever got by without one! haha.